Haiti Red Cross Society staff Chantal Pitaud and Mexican Red Cross delegate Raziel Urunga cleaning eight-year-old Misslove’s wounds that she received from being picked up and thrown in the air by the wind during hurricane Matthew (Photo: Nicole Robicheau, IFRC). A Red Cross team arrives in the town of Plaine Martin, in the hurricane-ravaged southwest of Haiti and a crowd of people quickly gathers around them. Jolanne Destinée shows her eight-year-old daughter’s injuries to Haiti Red Cross Society staff Chantal Pitaud. The little girl has open wounds on her head, elbow and leg. “The wind was so strong, it picked her up and threw her,” says Jolanne. More than a week after the hurricane, the girl’s wounds are starting to get infected. “It costs money to take her to the hospital and I have no money for this,” says Jolanne, who has been staying in a church with her 10 children since their home was destroyed by Hurricane Matthew. 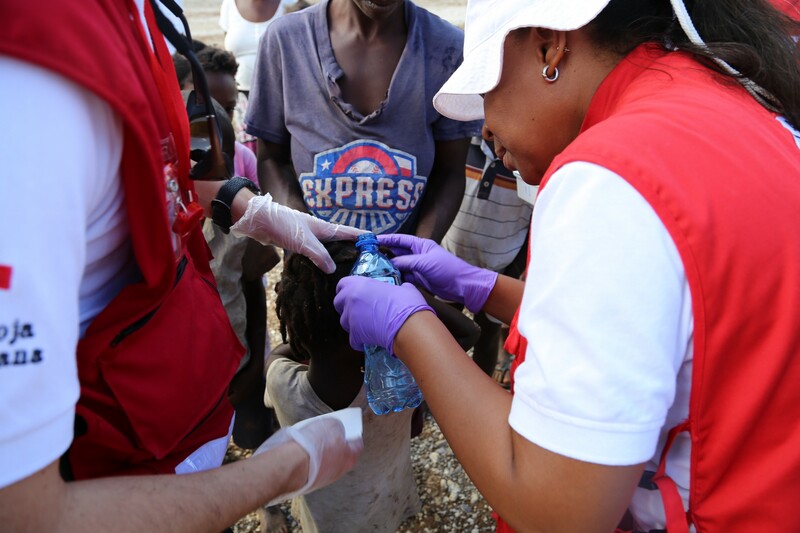 Red Cross volunteers clean the little girl’s wounds with antiseptic cream. Once they’re done, it’s Loriez Batiste’s turn. She shows them a wound on her face. “My head has been hurting because I fell on my face during the hurricane,” says Loriez. The Red Cross team cleans her wounds and gives her pain medication. 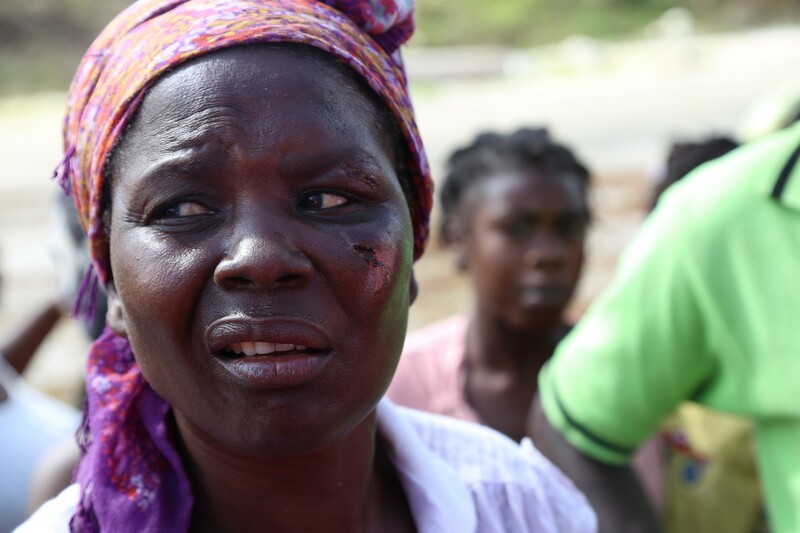 Loriez Batiste fell on her face during Hurricane Matthew and has had a headache ever since (Photo: Nicole Rbicheau, IFRC). Infections from injuries sustained in the hurricane are one of many health concerns in the aftermath of the storm. Cholera, spread through consumption of contaminated water, is on the rise. At the hospital in Port Salut, the director, Desrabires Stevenson, tells a Red Cross team that they currently have 14 suspected cholera cases at the facility. Prior to the hurricane, they hadn’t seen any cases in the previous four to six months. “We are missing the supplies we need to treat patients. We have no chlorine right now to disinfect,” she says. Most health centres and hospitals in the area had small cholera treatment centres set up adjacent to their facilities — capable of treating cases should they arise. As the structures weren’t as solid as hospital structures, most of them were destroyed in the storm. This is the case at the health dispensary in the coastal town of Roche-a-Bateaux. All that remains of its cholera treatment centre is the roof that’s now flat on the ground and a separate smaller building with a toilet. 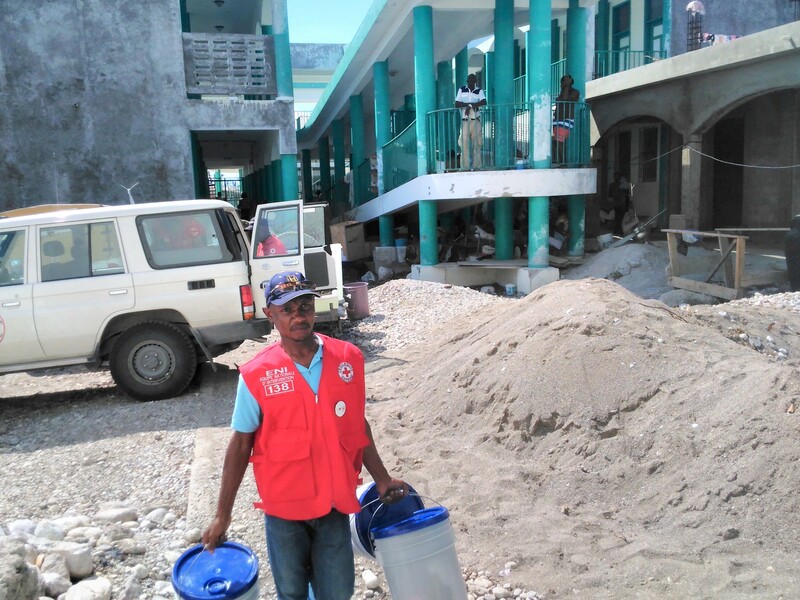 At the Port-a-Piment hospital further northwest along the coast, Haitian Red Cross volunteers distribute 69 cholera kits to be given to suspected cholera patients as they’re discharged from the hospital. These kits have everything people need to disinfect their homes and have safe water to drink, such as water purification tablets and soap. 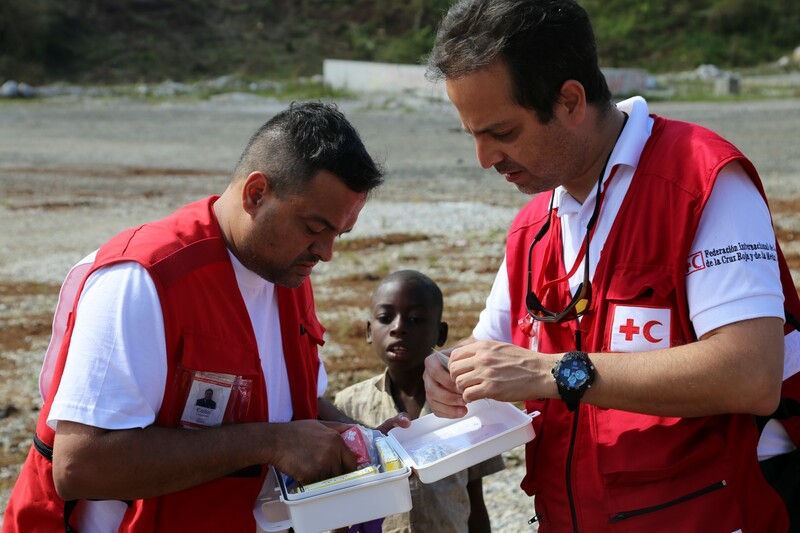 Haitian Red Cross volunteers distributed 69 cholera kits at the Port-a-Piment hospital for suspected cholera patients (IFRC). The Red Cross is scaling up hygiene promotion, water treatment and sanitation efforts to prevent the spread of cholera and other water-borne diseases in hurricane-affected areas, and is deploying an emergency health clinic and medical staff to provide mobile medical services in remote, hard-to-reach communities. 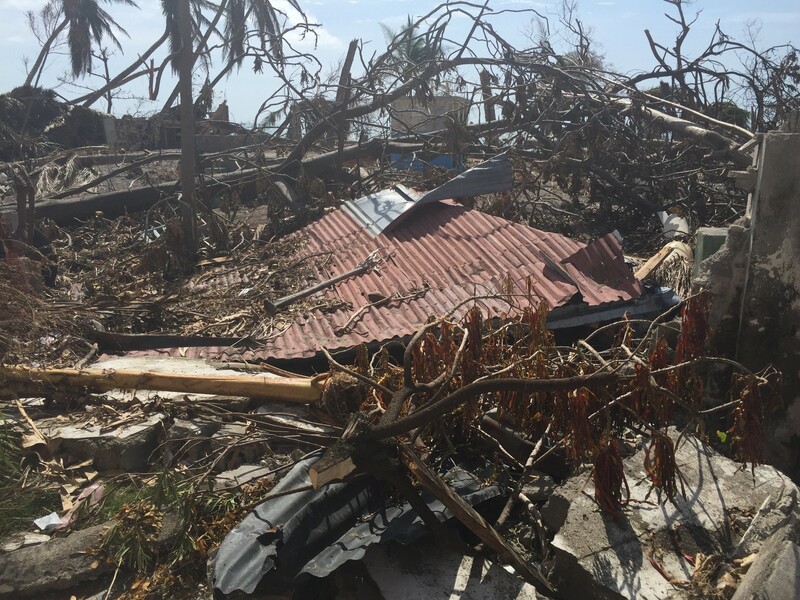 IFRC has launched an emergency appeal to support urgent needs in Haiti after Hurricane Matthew. To contribute, donate here.